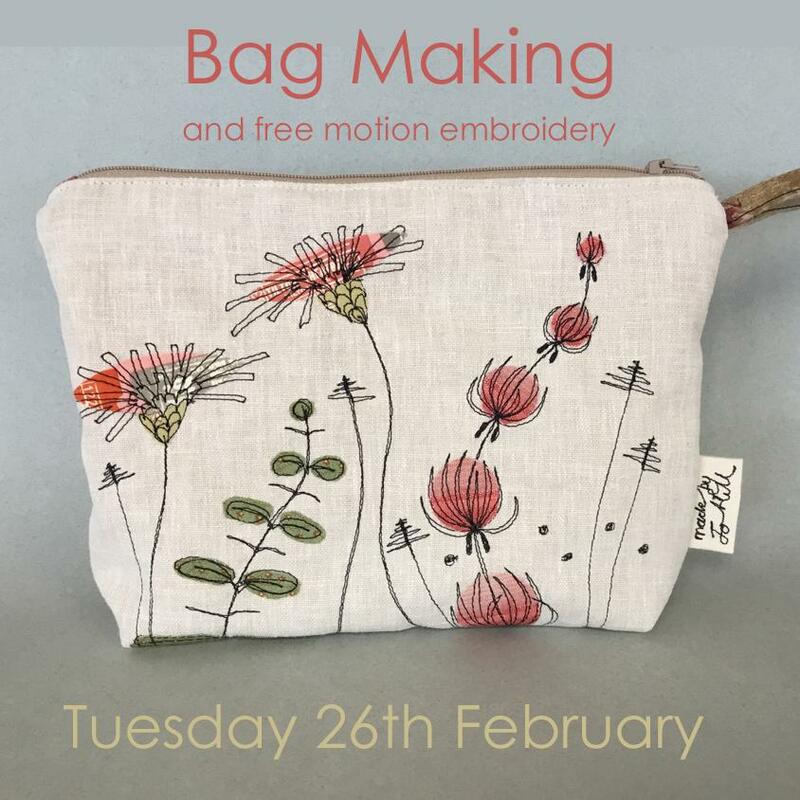 On this course you will spend the day in my garden studio in the Staffordshire countryside creating a unique cosmetic bag, decorated using appliqué and free motion embroidery. 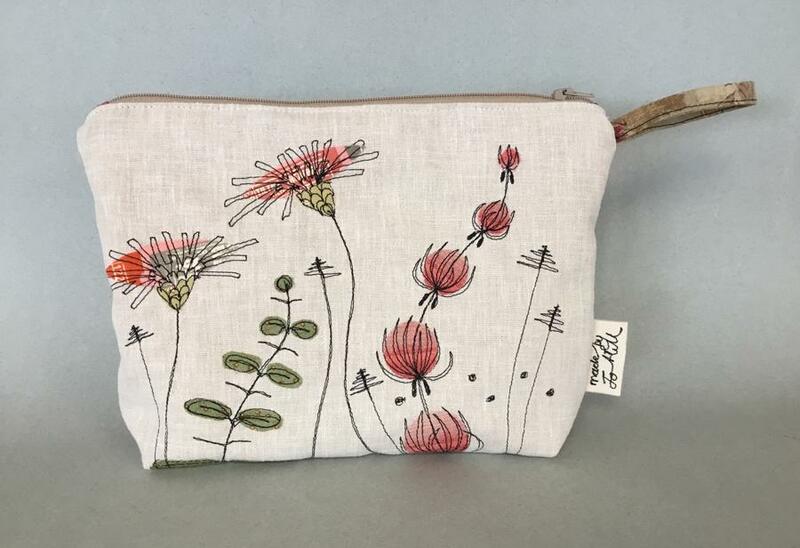 This workshop is an intermediate workshop and is suitable for those who have already done some sewing, and who also have free-motion embroidery experience - for example you may have attended my Flowers and Grasses or Garden Birds workshop and now feel fairly confident with this technique. 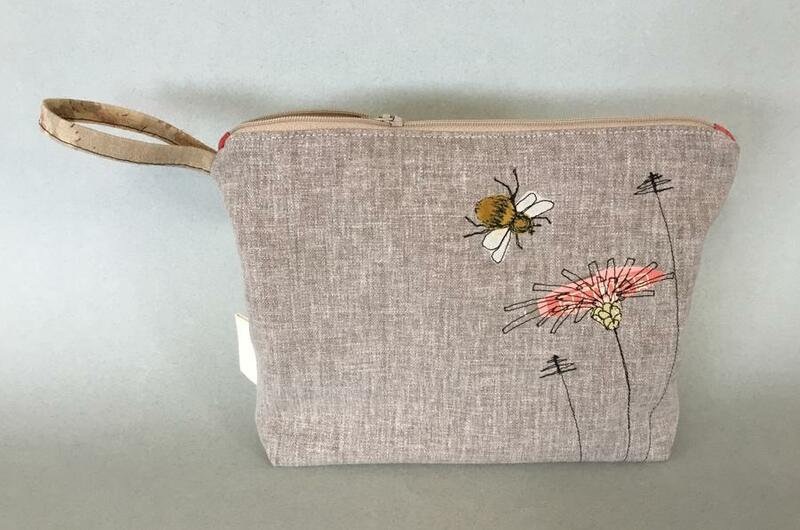 By the end of the day you will have created a lined, zipped cosmetic bag featuring a design of your choice that you can then use for cosmetics, pens and pencils or anything you fancy! You will be making the bag in the photograph with flowers on the front and a sweet little bee on the reverse. There will be plenty of inspiration available for you if you prefer to do something different - I have a library of design ideas all inspired by British wildlife. Use my unique hand drawn templates to create your unique bag design. I'll be on hand to guide you through the design process and to offer suggestions for colours, design and placement. If you would like to bring your own design ideas, please do so! You will spend some time practising and then we'll launch into the finished bag design fairly quickly. After lunch you'll make up your finished pieces into a bag. You'll learn how to line the bag, insert a zip (experience of inserting a zip is useful but not essential as I'll teach you my technique anyway), create your own personalised hand-stitched label and how to create a professional look for your cosmetic bag. Please bring your sewing machine, general sewing kit, packed lunch, sharp scissors and an embroidery hoop measuring 7" or 8" in diameter and 1cm deep. Embroidery hoops will be available to purchase at the workshop (subject to availability) at £3.50 each. You will also need to have a sewing machine where the feed dogs can be lowered to enable free-motion stitching, as well as a darning/embroidery foot for your machine, and a zipper foot too. All fabrics and components will be supplied but feel free to bring your own thin fabrics if you have a particular colour scheme in mind. Thin fabrics include cottons such as patchwork and quilting fabrics or shirt material. If you want to bring your own design ideas please do so.